Welcome to Day #13 of the Restoration Project. One of the rich blessings from my time at the Declare Conference was meeting Jan Greenwood. Jan gave a powerful message. She exposed the enemy’s lies and then had us declare the lie we’d been believing and the truth that we were receiving by faith. Jan gave me a copy of her book Women at War. I was planning on giving it away to one of you but, alas, I dropped it in the tub and had to use my hair dryer to dry it out. Thankfully, I was able to salvage it, but now the pages are crinkly. It’s probably just as well because this is a book I want to hold on to. The truths within it awakened some important things in me—things I don’t want to quickly forget. 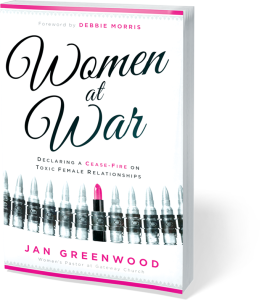 Woman at War is a power-packed battle guide for calling women to freedom through revelation and spiritual training. Jan addresses mother/daughter relationships, sister relationships, friendships and church ministry relationships. She points us to the truth and offers practical resources for walking out the principles found in this book. I am glad that I read Women at War and recommend that you read it too. You can download the first chapter for free. So what does this book have to do with restoration? A lot! After reading it, I was called to action—to be the woman that God created, to stop letting the enemy uses his tactic to trip me up and try to take me out. I felt like several issues I had been dealing with were put to rest, or at least experienced a cease-fie, as I read the freeing words found in this book. 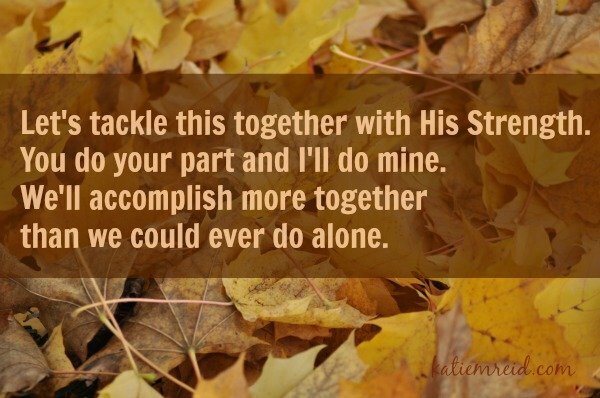 Do you have strife in your relationships with other women (a relative, co-worker, or ministry leader)? Jan encourages us to stop fighting each other and, instead, fight the enemy by becoming who He has called us to be. Do you have unrest within because you feel unloved and alone? Jan exposes an issue that I often struggle with, the orphan spirit. “Those who suffer with an orphan spirit don’t feel they can depend on others…They are plagued with thoughts like, Nobody loves me. I don’t really matter. I have to take care of myself because no one else will” (excerpt from page 58). Obviously, these things aren’t true, but when you allow this spirit to reign in your thinking it can do real damage. Are you willing to respond to God’s requests with a “yes” and rest in His Sovereignty, even when it is costly? Jan talks about Mary and Elizabeth from the Bible and how “they received not only a deposit of life, but a gift of faith. That faith gave them grace to accomplish what God was asking them to do” (pg. 69, Women at War). Dear God, Please unwind us from the lies that the enemy uses to trip us up. Forgive the offenses that we carry and those we have committed against others. Help us to know the truth, Your Word, so that we are not tricked. Please expose the dark and shed the light of Your love within us and through us. Where the enemy has robbed us, please restore us. Where we’ve been broken, please heal us. Help us to stop fighting each other and, instead, stand shoulder-to-shoulder as we follow Your path. Thank You for making us women. May we embrace Your calling and stand for You. Uphold us Lord and set us free. In Jesus’ Name, Amen. 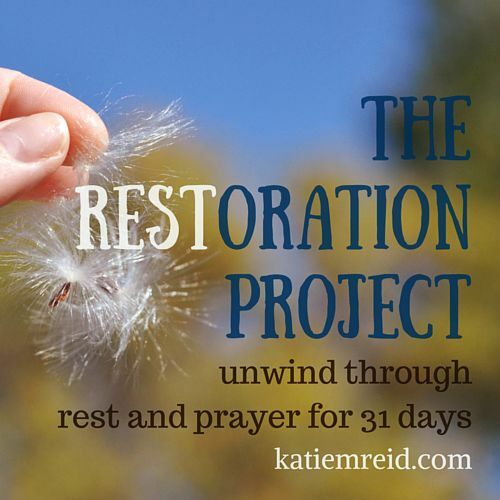 You can get caught up here on Days 1-12 of the Restoration Project. P.S. Linking up with Purposeful Faith today for the #RaRaLinkup, come join us! Katie, thank you so much for this awesome review and your Periscope issue. I simply loved hearing how God spoke to you – and then how you responded. What a precious heart you have – teachable, obedient and kind. No wonder so many others follow your leading. I would like to send you a couple of copies Of the newest book cover – one for you and one to give away to your followers. Private message me a mailing address and I will send it along the way. I’m going to share your review on my blog – so proud of it. Thanks again. And finally – congratulations on your pregnancy. What wonderful news. It’s obvious you are an awesome mom.